I'll make it really fast and keep it short and simple. Does anyone have a 1:1 Tepig for sale? And some charms! 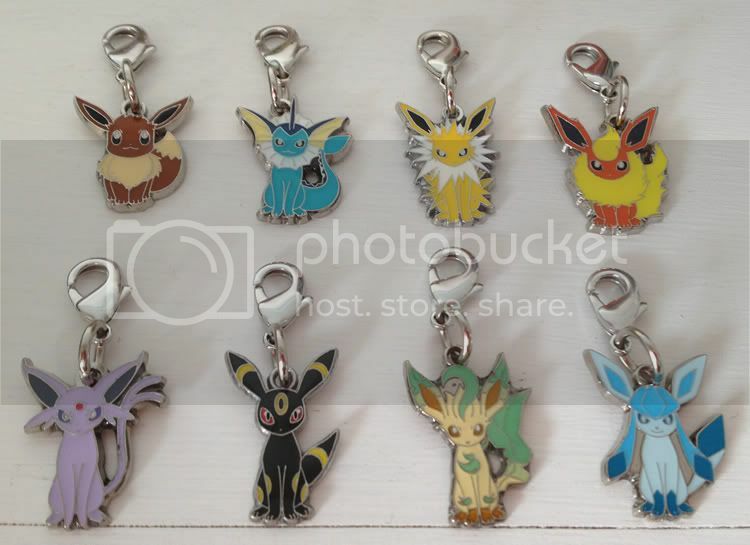 I have an extra set of the Eevee family and I decided that I do not need them so they are all $10 EACH SHIPPED ANYWHERE! 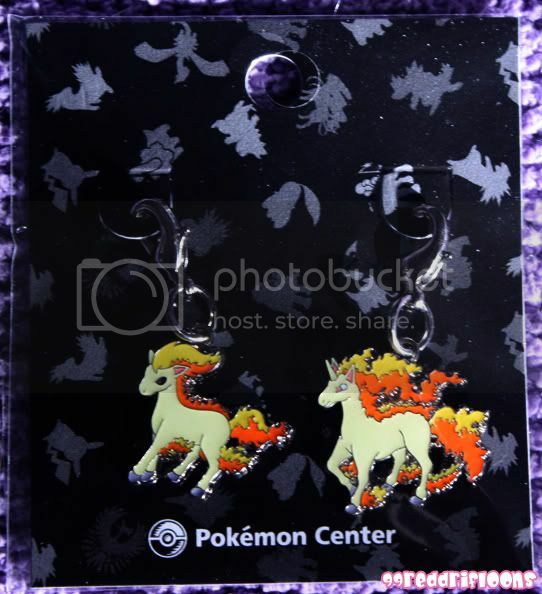 Also, I'm still looking for one more Johto Dex Ponyta! Please let me know if anyone has one they're willing to part with! Hi, everyone! The Pokemon League is this afternoon, and I'm going to go! I'm going to try to trade up some of my old cards so that I can get the newer ones, in order to spend less money. I was trying to get a good idea of what my cards were worth (via eBay), and I came across a huge disparity in price for a certain card. I was wondering if you experts could help me out! 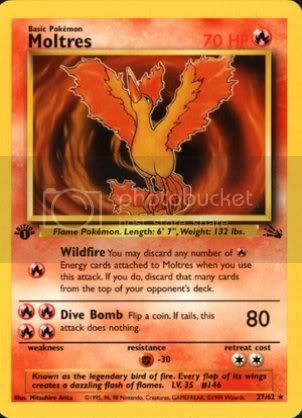 It is a first edition, Fossil Moltres (non-holo). Also, it's in French. Does that make it more valuable, less valuable, or not affect the value at all? I'm no expert, but I'd say that it's in near-mint condition, as it's been in a card protector and a binder (3 cheers for overkill!) for as long as I can remember having it. I've seen prices of $.99 for this card, and I've also seen it for about $7... I just don't want to get ripped off when I try to trade/sell them later tonight. And none of these cards are in French (mostly Japanese or English). Any help would be greatly appreciated! First off, it seems a big majority of the Mini Pokedoll keychains are arriving undamaged. I am very very glad to hear these reports, but I still want any member who's doll arrived with crushed packaging to tell me. The "protection" (or lack thereof) was inadequate for them and I take 100% responsibility, and will replace any damaged packaging free. Please let me know! So, I was looking at the beautiful new banner by ktmonkeyj and thought that the sticky post, which had nothing really urgent on it for the past week or so, was really messing up the vibe. So I think since the MOST IMPORTANT things are on the sidebar for now, I'll only sticky that thing if we really need to alert you guys to something major-- new Pokemon news (you might wanna collect it, k), ripoffs/bannings (which only happen if someone was really causing a problem you should know about), contest voting, etc etc.... how's that sound?! POKEMON DOLL STAMP Goodies come out tomorrow! How about a MINI ONE DAY CONTEST?!?!?! SO!!! I'll post the image we were all using, and then YOU GUESS WHAT THE TEN STAMPS ARE! If you guess the ENTIRE set correctly, I will send you one (BLIND PACKAGED okay)...for cheap as free! You CAN copy/agree with another member's guesses, but I recommend not doing this. -The reason is, I will send the prize to the first THREE members to guess correctly! Over half of the commissions have been shipped! You can check out my post here to see who has been completed and who is next on the list. If your name is crossed off the list, and you haven't received a shipping notification please let me know and I can give you that information. I like doing commissions because it takes me out of my comfort zone for a challenge, and I learn about Pokemon I haven't really heard of or seen before. I didn't play any of the games past red/blue, so I only really know the Kanto and Unova region Pokemon, and a few of the popular ones in between. I've been spending too much money here, so I am definitely going to be taking on more commissions in a few weeks! I still have 4 more to make, BUT you can ask me questions here if you are thinking about ordering from me in the near future. I can give you estimates and let you know if it is possible for me to make the Pokemon you have in mind. I don't do human characters at this time. Remember, asking me here does not guarantee you a commission slot. I'm just doing this in case anyone wants to ask ahead of time so they are prepared when I open the slots again. pokemon official site has updated with better pics of the previously revealed black and white kyurem plushies, along with more goodies! 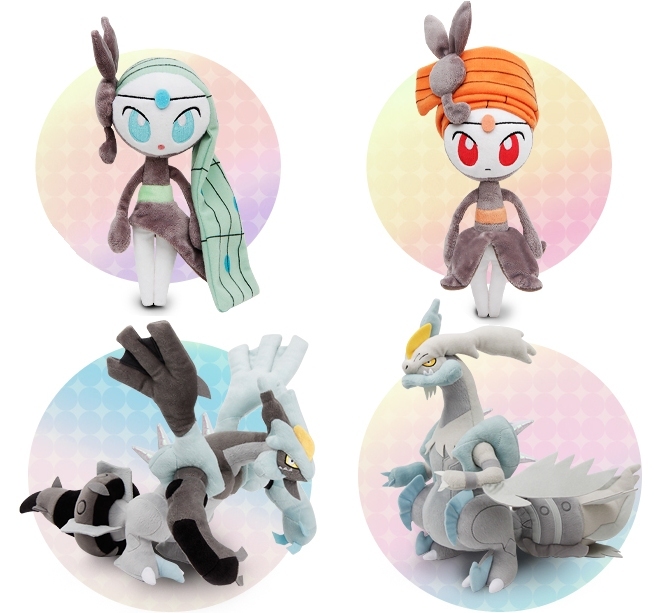 meloetta pokecen plush come out june 16th. 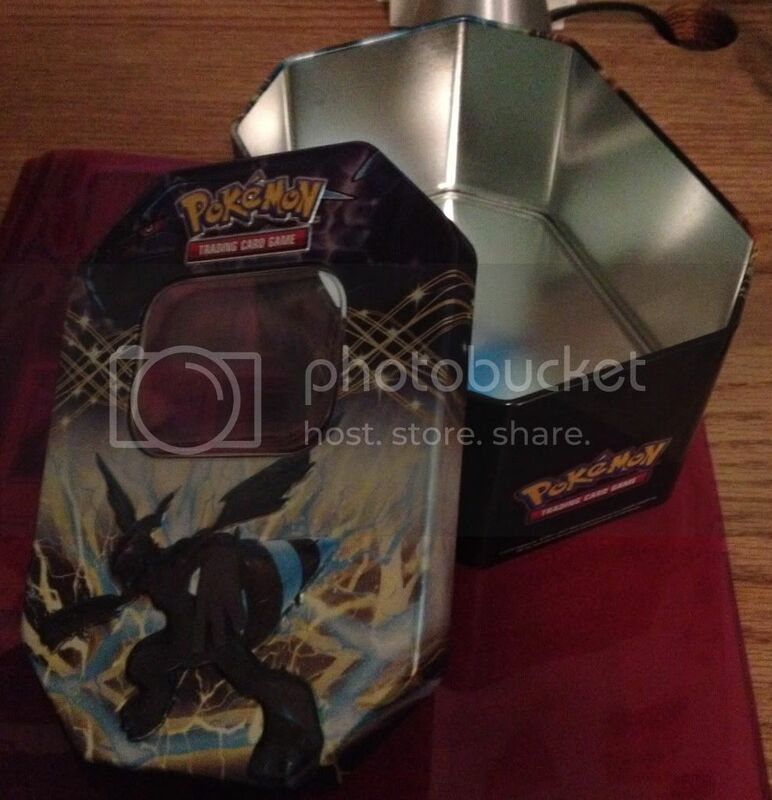 black and white kyurem are of course, june 23rd release. click to enlarge. 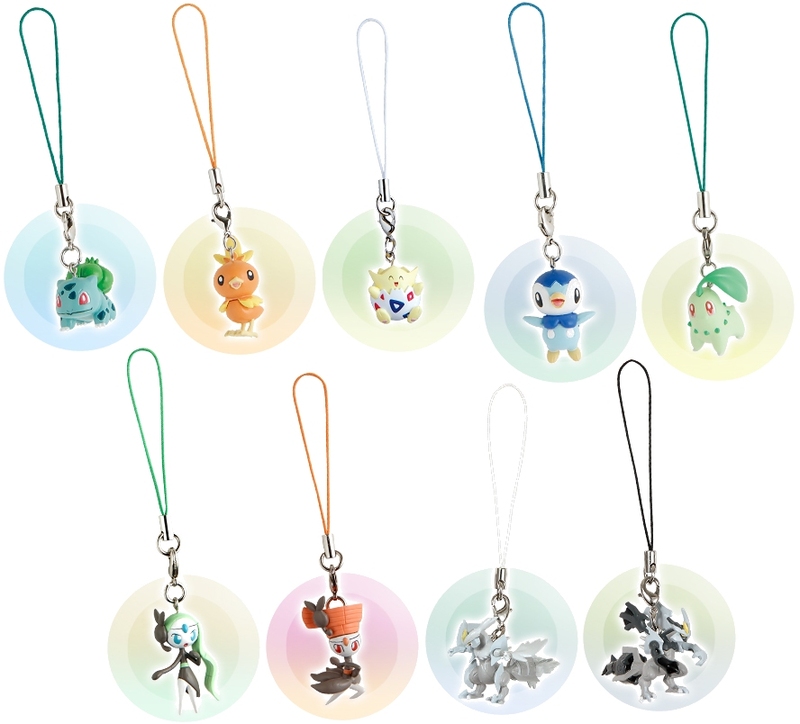 all of these new straps come out june 16th... except black and white kyurem, who come on june 23rd! click to enlarge! you can also see new various DS/3DS goods on AAPF and the official site. Hello community! I need your help... I want multiple cards from Dark Explorer set. I can buy or trade (i have goods and cards for trade). anyways i've added some TFG figures i received in a lot! they will be in the sales link below! Preview of the trio can you guess who they are? Can you guys imagine the merch for these 3?! Also, if this isn't allowed, i'll delete it. Just a heads up i am moving from this account to a new account because this is a OpenID account i cant use the feedback page i have set up my new accounts feedback page http://feedback.pkmncollectors.net/feedback/view/xanxas/ ill fully be moved in about a week. Pokemon Doll Stamp! Pins Sale! 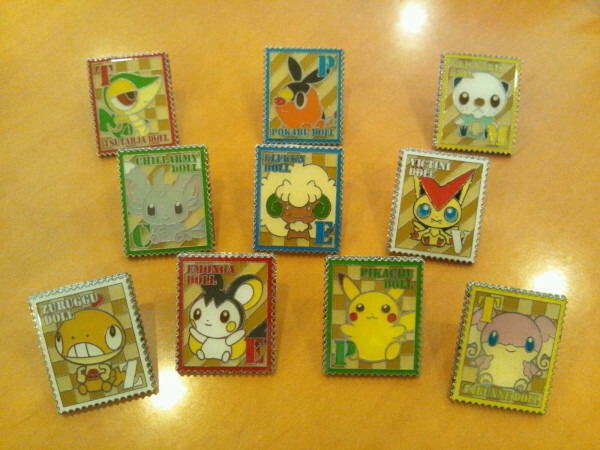 AND THE TEN POKEMON DOLL STAMP PINS ARE...! Oshawott, Snivy, Tepig, Victini, Pikachu, Minccino, Whimsicott, Scraggy, Emolga, and Audino!! Now, for photos, and sales of my opened ones! Just comment to claim. And thank you! * Collection Site Might consider trades! * Click Here For Permanent Sales! * Click Here For Other TCG Sales! I only included updated BW images but I have tons of other cards, you can read the full list here and inquire about availability and price. * I mightttttt be up for trading, especially for these; Whimsicott(NV), Shelgon, Aipom/Ambi, Larvi/Pupitar, Gligar/scor, Munchlax (jp only) Spoink/Grumpig, and Drifloon/blim. Also! I'm trying to find some plush artists to commission; does anyone know of any artists from dA that make awesome plush? So I was cleaning my closet when I came across this neat paintings I bought last summer as part of a lot a friend sold me. Although I like them to want to keep them, I have nowhere to place them, and here they will get damaged eventually in storage, so I think its time for them to go somewhere where they will be made justice and be properly displayed. aaand fan favourite Nate the honorary Twigtoed! - Do you find people tend to be understanding about your collecting? What kind of opinions do parents/significant others/friends have towards it? - If you wear/carry any part of your collection out in public often, do you ever tend to feel paranoid or get any reaction (positive/negative)? - Does the weakening economy (lack of jobs/inflation/etc.) affect how much you spend on collecting or not? - What makes collecting such an enjoyable hobby for you? Helloh everyun~! There's still pretty much everything left from my last sales(sans the Teddiursa), so I updated the prices and added something new. 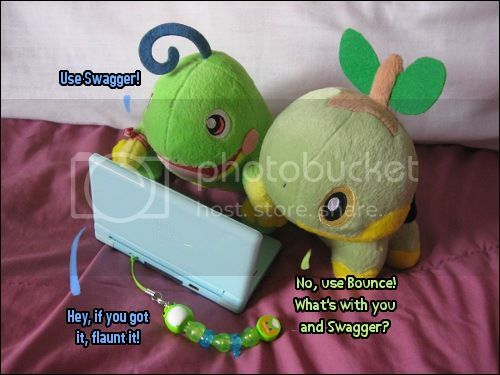 Things left include the two pictured items, a Minccino Pokecen Charm Set and a Bidoof Pokecen Charm set. Feel free to ask if anything is unclear. You may also still post answers to my Pokemon Time meme :3(Which Pokemon you'd like to be featured) Have a great weekend!